According to the Palestinians and their supporters, Israel's West Bank Barrier has become "the most visible manifestation of the Israeli military occupation and most pressing issue for Palestinians. Often misleadingly called a 'fence', the considerable structure snakes through the West Bank on Palestinian land, leaving Palestinians on the wrong side isolated from their land, extended families, and way of life" (http://electronicintifada.net/bytopic/apartheidwall.shtml). It is called the Israeli Apartheid Wall and hundreds of Palestinian, European and even leftist Israelis demonstrate almost daily against it, sometimes violently, asking to remove it. In a conference lately held at the Columbia University, Noam Chomsky, famous American linguist, known more widely as a political dissident, anarchist, and libertarian socialist intellectual, attacked the “monstrous” separation wall, which he called the “wall of annexation” since as he stated, it has nothing to do with security; the separation wall is more sinister-and longer-than the Berlin Wall ever was, he said. This author considers the West Bank fence/wall (the wall represents only a small part of the barrier) a strategic error with mixed security results. It was built under strong Israeli public pressure at the height of the Palestinian Al-Aqsa intifada, when during the bloody 2000-2006 years more than 1,100 Israelis were killed and more than 7,000 injured, mostly civilians (See the statistics of the Israeli Security Service -ISS, in Hebrew, at http://www.shabak.gov.il/publications/study/Pages/terrorsummary.aspx). It is true the fence was one of the means to stop the wave of suicide terrorism responsible for most of the civilian victims in Israel and diminish the number of casualties in Israel and the West Bank in 2009 to only five (5). However, most of the credit goes to the intensive and effective intelligence and operational activity of the ISS, the Israeli Army and the Police since 2002. On the other hand, the fence/wall is not an "Apartheid" instrument against the Palestinians, but rather a new Ghetto for the entire Israeli people. Only days ago the Israeli government has decided to build a new security fence along its border with Egypt in order "to close Israel's southern border to infiltrators and terrorists." 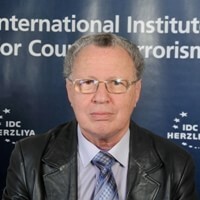 Eitan Haber , the known Israeli journalist and bureau chief of the late Israeli PM Itzhak Rabin, wrote about this decision: "We were hoping that at least one border will really become a border of peace; a frontier without a fence, a sort of outlet for a state that is being choked by fences. Yet even this small and unrealistic dream is now being taken away from us." Israel and its people, who were the first to suffer from the deadly consequences of the Palestinian intifada, are the ones accused by humanitarian organizations, the media and even by friendly governments to be responsible for the present situation. These cynical accusations testify of a double standard taking in consideration that other "walls" and fences in areas of conflict are rarely mentioned: the one Saudi Arabia built on the border with Yemen to defend itself against Shia tribes; the barrier on the USA/Mexico border against drug and people smugglers; or the Ceuta and Melilla barriers, meant to stop the flow of African immigrants to Spain, and Europe in general. The Belfast "Peace Line Wall"
The Belfast "Peace Line Wall" is probably the closest example to the West Bank "Wall", in the sense that it separated two communities, the Catholics and the Protestants in Northern Ireland capital, fighting in a bloody conflict since 1969. This is the conflict which is considered to have been resolved in a peace process almost parallel to the peace process between Israel and the Palestinians. The Peace Agreement (also known as the Good Friday Agreement or Belfast Agreement) was reached on April 10, 1998. Actually, its practical implementation began only in May 2007, when a power sharing executive was again established to govern Northern Ireland. However, the core issue that is the final status of Northern Ireland has remained open to be decided in the future by its population through a "democratic process". Meanwhile, the Real Irish Republican Army, otherwise known as the Real IRA (RIRA), continued since 1997 to stage rare terrorist attacks in Northern Ireland. RIRA is a split organization from the Provisional Irish Republican Army (IRA), the Catholic partner to the Good Friday Agreement. In November 2009, the Independent Monitoring Commission released a report stating that the threat from the RIRA and other dissident republicans was at its most serious level since the 1998 Good Friday Agreement. Interestingly, the Good Friday Agreement was achieved under the auspices of the United States Special Envoy for Northern Ireland, Senator George Mitchell, which these days is President Obama's special envoy to the Middle East charged with the renewal of the peace process between Israel and the Palestinian Authority. So what happens today in Belfast? Catholic and Protestant sectors of Belfast are still separated by an ugly wall reminiscent of a wooden fence in a ramshackle baseball park. The wall stands as a reminder of unresolved resentments and tensions (John Zogby, Forbes.com, December 10, 2009,). "As you travel around this city there are physical reminders of the past, but also reflect the present and most likely the future. Twenty kilometres of so-called peace walls; huge structures that separate Catholic from Protestant. And in the new political order, is now the time for the walls to come down? The answer from those who see them as protection is almost unanimously no. After speaking to families on both sides of these dividers, it's clear it will take years before there's enough confidence to destroy the walls, if ever. That seems like a depressing conclusion, but perhaps not, because for the most part the killing has stopped; the walls do work" (Phil Williams' report on Northern Ireland; the Australian ABC Radio National, July 19, 2009). And what about international protests? In this case, young people from around the world chose to manifest by painting the wall. ILoveGraffiti had the pleasure to be involved in a historical paint event during Easter 2009 in Belfast, Northern Ireland. A wall, much like the Berlin Wall and up for just as many years, got painted for the very first time in history, in the area of the city were the heaviest of the fighting took place over the years. Its long been a dream of mine to paint the peace line in Belfast, Northern Ireland. Particularly the one that separates the Falls district from the Shankill districts. I grew up in Ireland during the height of the troubles, memories of the hunger strikes, random sectarian murders and bomb attacks are vivid memories for me and from an early age, I have been aware of the difference between “them” and “us”. Little did I think 20 years later I would be standing in the heart of the area were so much division and hatred was born painting a mural of peace. This small area of Belfast has been a flashpoint for many years, in fact a very large majority of all the murders by paramilitary groups during the conflict took place within a 1 mile radius of the wall that we painted. The peace line as it was called was constructed at the height of the troubles, in sections it has gates which are closed at night effectively shutting off catholic areas from protestant ones. Even today as you look at the wall you can see whole streets were in effect halved by this wall, coming to an abrupt end where the wall towers towards the sky. In the past whole streets had been torched as a form of ethnic cleansing had taken place most notably Bombay street had been raized to the ground. On the protestant side many of the houses just inside the peace line had been demolished due to constant attacks, on the catholic side I was amazed as I saw whole backgardens behind the wall enclosed in armored fencing with children's toys scattered underneath. This was a place of extreme division and hatred. The wall itself is a huge structure first a large section maybe 12 -14 feet high then large metal sheets and atop that more fencing. High enough to stop most missiles from being thrown over. The whole wall is peppered with AK rounds, Magnum rounds and scorch marks from many petrol bombs and other explosive devices. We grew to a group of 19 guys assembled from New York, Australia, Germany, Denmark, North and South of Ireland and the United Kingdom. We began painting the wall on the Sunday night after arriving in Belfast about 7.30 pm, getting up first outlines and planning the concepts. We returned to the wall before 8 am the Monday morning and by 7.30 pm we were getting photos and packing up to go home to our homes across the globe after a job well done.